Title text: With just one extra line, he could have anticipated the 2003 film The Core, but some things are too audacious for even the greatest visionaries. I can't believe I'm the first to post it. What's happening to these fora? Last edited by gmalivuk on Mon Jun 25, 2018 4:49 pm UTC, edited 1 time in total. nightbird wrote: I can't believe I'm the first to post it. What's happening to these fora? You were the first to post it, but you posted wrong. Explainxkcd had the page up at ~0400 (either UTC or UTC+1) more than 12 hours before this thread. It may not be either/or but both, as in the Star Trek episode "Mirror, Mirror". The diagram is wrong, anyway. With an angled-up canon firing out, a freefall canonball will never enter a stable circular orbit like that. Even the others seem to inherit a side-wind or something. Soupspoon wrote: The diagram is wrong, anyway. With an angled-up canon firing out, a freefall canonball will never enter a stable circular orbit like that. Even the others seem to inherit a side-wind or something. that doesn't help. every orbit with only one boost will always intersect the startig point. you need a second burn to circularize the elliptic orbit. I think it's only obliquely referencing Newton's cannonball, which was just a cannon firing straight ahead from a raised platform (which can hopefully be retracted 'lest it shoot itself in the event of a vacuum). This diagram seems to feature a series of rockets lifting off from a proper launch pad, performing varying gravity turns. The first one just crashes, which does result in a fiery, toxic, carcinogenic mess weapons of sorts. The middle one seems to be an ICBM -- ending civilization in fire. The last is of course a simple but pretty sharp gravity turn into orbit. speising wrote: that doesn't help. every orbit with only one boost will always intersect the startig point. you need a second burn to circularize the elliptic orbit. 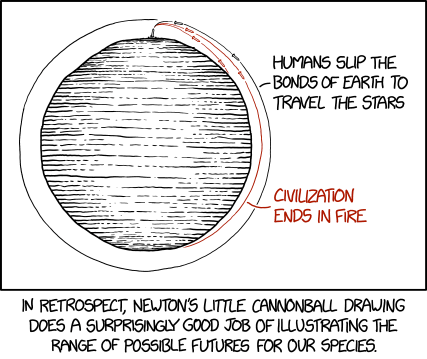 If you look at Newton's old diagram, that cannon is pretty blatantly shooting itself. I think he either assumed a vacuum, or a very high platform. It's a horizontal cannon on a (to scale 1000 mile altitude and well above the atmosphere) mountaintop, so yeah, with the right projectile speed it's shooting itself. And yes, Newton must have been "assuming away friction" for this diagram to make any sense (at least for the longer trajectories). What I'm wondering is why Randall didn't come up with a label for the shortest trajectory (D) ... maybe Evel Knievel's Snake River Canyon jump? Heimhenge wrote: What I'm wondering is why Randall didn't come up with a label for the shortest trajectory (D) ... maybe Evel Knievel's Snake River Canyon jump? Or include the still-shorter trajectory in which the projectile is fired straight up and the cannoneer has to run to get out of the way before it comes down (and maybe even the Buster-Keatonesque outcome where Coriolis force makes dodging your own vertical fire unnecessary). Last edited by da Doctah on Tue Jun 26, 2018 4:45 am UTC, edited 1 time in total. da Doctah wrote: in which the projectile is fired straight up and the cannoneer has to run to get out of the way before it comes down (and maybe even the Buster-Keatonesque outcome where Coriolis force makes dodging your own vertical fire unnecessary). And thus your attempts to dodge land you directly in the line of fire after all? Story of my life, man. Story of my life.